Altkloster (fictional) is a small town in southern Germany. Its main claim to fame is the old monastry, accessed by a 2km hillside walking track from the town, which is used by many tourists and pilgrims. The town and tourist trail is served by a railway station which is astride an electrified main line, but also serves on a double track non-electrified line, which joins other local areas. So the station has 5 platforms. The station was built about the 1890s, but has served the townspeople well, and been expanded as required. Situated to the east of the Rhine, it is used as a border station by some French passenger trains, and as an interchange for cross-border freight. I often holidayed from high school with an aunt and uncle in the area, and because of my interest in trains, they encouraged me to practice my interest in photography as well. 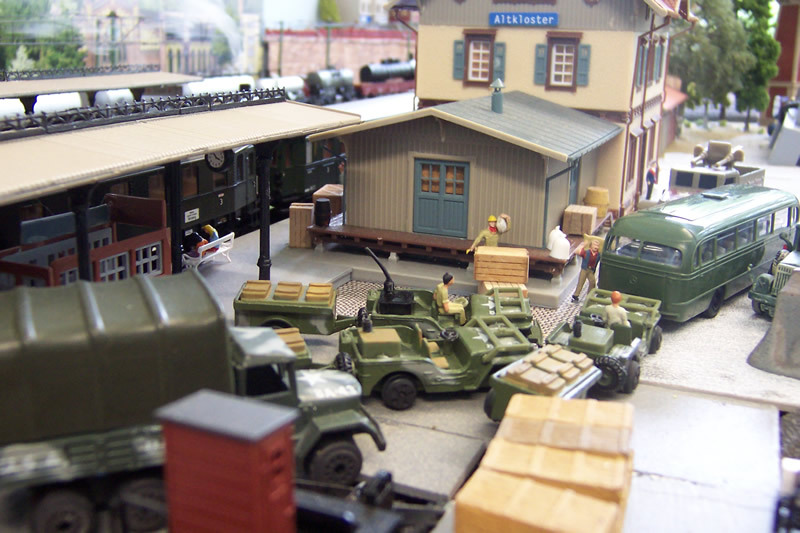 In this scene from 1952, a brigade of the occupying US army has just detrained from a local train (the Hecht car and Wurrt car at the platform) and piled into the Mercedes Benz army bus. Gear is loaded into the jeeps and trucks. 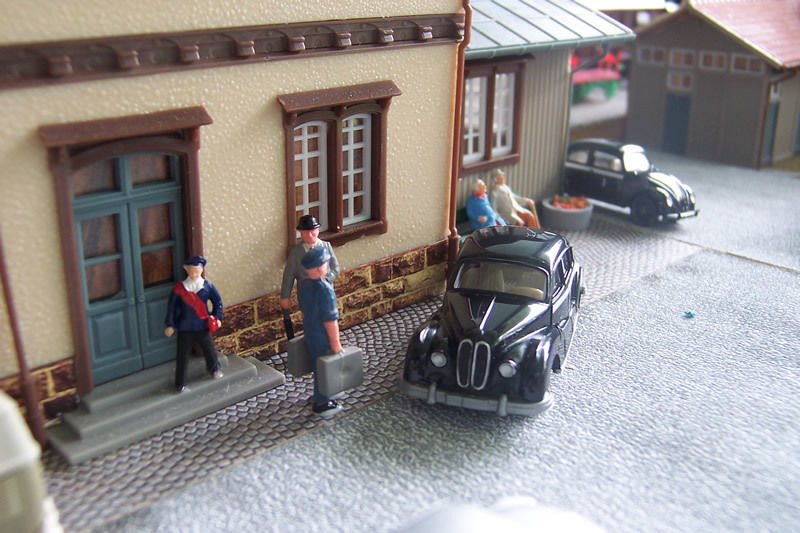 On the station forecourt all is busy, and vehicles must jostle for position. On the platform, a few travellers sit waiting for another local train. In the background, a freight train of mainly tank cars, passes. 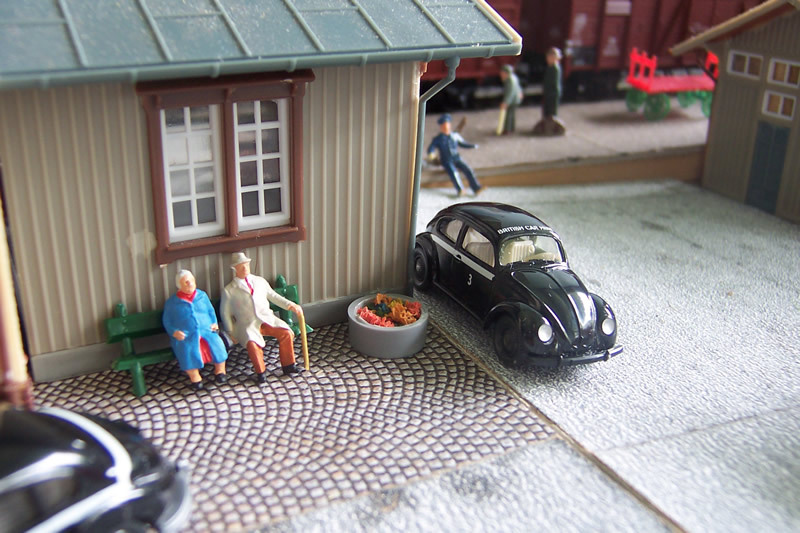 A couple, of advancing years, enjoy a spot of sunshine, awaiting transport from the station. The circular garden bed adds a nice touch of colour. Note the VW and BMW taxis waiting for a fare.